The jewelry shown here has the look of antique ivory, but it actually polymer clay that is "aged" with acrylic paint and sealed with a matte finish. The pieces have a wonderfully distressed look. The bird will be hand sculpted to match your favorite bird, photos are welcome to work from. 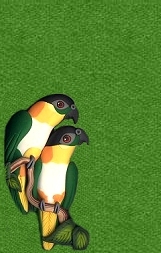 The custom jewelry in this style may include charms, earrings, charm chokers, pins, pendants or necklaces in your choice of parrot, with optional matching bead earrings. Each beaded necklace will be unique, and include faux ivory beads, earth toned wooden beads, as well as gold toned metal spacers. Glass beads and semi-precious stones may also be used. If you prefer certain bead colors such as golds, blacks or browns, just make a note when you place your custom order, and Alicia will be happy to pick or make beads in your color scheme. The necklaces are strung on black or brown leather cord and finished with a lobster style clasp to your specified length, with an optional extender to make it adjustable. Bird face measures 1/2" to 3/4", with small spring clasp suitable for attaching to a charm bracelet, purse, cell phone dangle, etc. Bird face measures 3/4" to 1", strung on black leather cord to 16" or your preferred length. 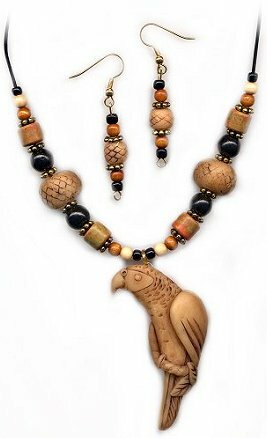 Full bodied bird in faux ivory, strung on leather with matching beads in your choice of color scheme. Beads may be made from polymer clay, glass, wood, stone and other materials. Matching beaded dangle earrings are included. 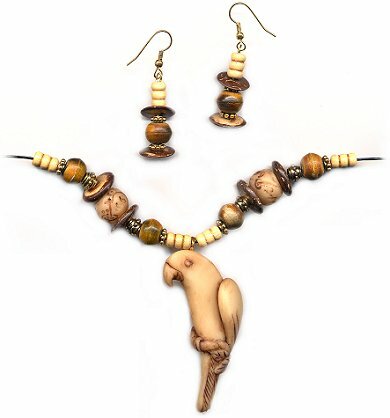 Two full bodied birds in faux ivory, nestled together, strung on leather with beautiful glass beads in your choice of color scheme. Matching beaded dangle earrings are sold separately, see below. 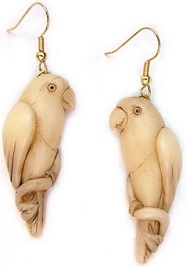 Faux ivory full bodied birds, with gold toned wire dangles, or post backs. Have your pendant strung on a black leather cord. Vegan friendly option, have your pendant strung on a black leather-like cord.